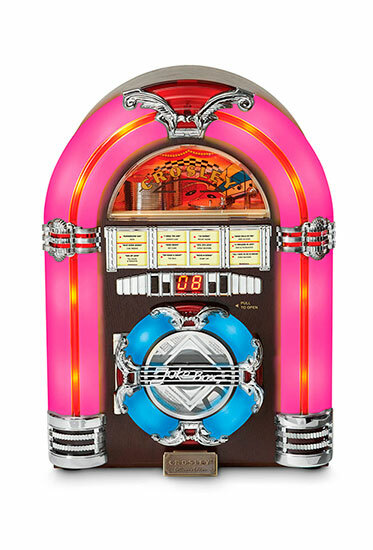 This reproduction of the classic 1947 jukebox takes you back to that ever-so-fond memory of sitting in your favorite diner. The song chart flips to reveal the turning dial and volume control, while the color shifting LED lights provide a little bit of ambience. The handcrafted wood and veneer cabinet features a compact disc player, AM/FM radio and portable audio input for connecting smartphones or other external audio devices.